Earlier this fall I promised myself (and declared to the world) that would keep working through the winter, no matter what. But my resolve is being tested. It’s easy to make promises on a sunny day in the 60’s (just like it’s easy to start a diet on a full stomach), but it’s hard to follow through when the sidewalk is covered with ice and daytime temperatures hover in the 30’s. So I am taking the easy path by skipping ahead and working on the boat’s rudder, which I can build in an unheated but slightly warmer woodshop adjacent to the garage. 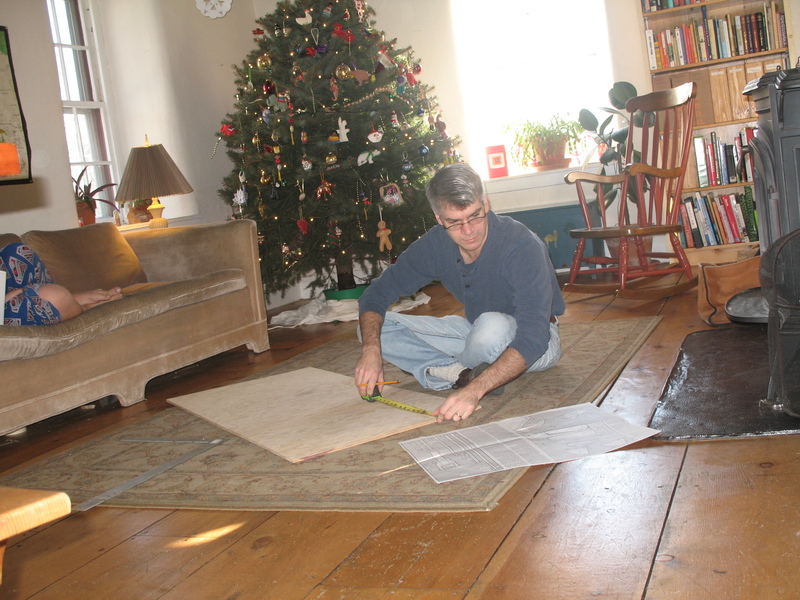 In the interest of comfort and holiday conviviality, I even brought my lumber inside and marked lines by a warm fire. Our cat assisted. Donning a warm coat, hat and gloves, I dashed outside to cut the pieces with my jigsaw. After a fast sanding job, the pieces are now ready to epoxy. I’m just waiting for a slightly warmer day to get the job done. If I get antsy, I might even spread newspaper on the dining room table, and glue the parts inside. My wife would love that. Over Thanksgiving, I showed photos of my boat to one of my relatives. She was not impressed. “So you haven’t gotten very far,” she said after looking at the most up-to-date pictures. Take a good look. When the seats are installed you won't see all the time spent installing the stringers. I maintained my composure. After all, she’s a kind and loving person. But it was a very deflating comment. The problem is that the labor is hidden. A casual observer simply sees the curved box with the crude beginnings of a cabin and cockpit. But the real work is not represented by the boat’s size or even its overall shape. It’s found in the angles that must be measured and cut, the sanding and shaping required to make watertight joints, the tedious work of gluing each piece in place. And, of course, there is all the time spent staring at the plans and rereading the instructions, trying to avoid mistakes. Even now, nearly nine months into my project, I am still learning that 90 percent of the labor in boat building is preparatory work. I go out to the garage determined to, say, install the seats. How hard can that be? I’ll be done before lunch. But once there, I realize that I must first install roughly 30 stringers, and each stringer must but cut to length, angled, and trimmed. I must make countless measurement to assure myself that the stringers are properly located on the hull sides, and I must mark and predrill dozens of holes for dozens of screws. So instead of finishing the seats, I spend an entire morning cutting half of the necessary stringers. A few days later I cut the rest of the stringers. The following weekend, I glue them in place. The day after that I decide to caulk seams that will be hard to reach when the seats are installed. 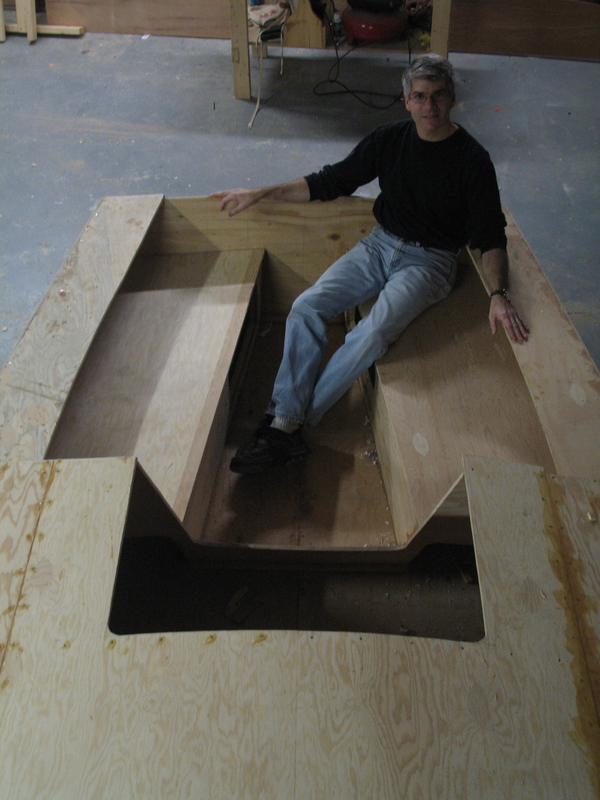 Hours, days and, eventually, weeks pass before the “preliminary” steps are finally finished and I am, at last, ready put the plywood seat bottoms in place. Of course, when the seats are installed, all of my time-consuming work will be hidden from view. Out of sight means out of mind and I alone will know what was required to make a simple and unadorned plywood bench. My niece will look at the seats and wonder what all the fuss was about. 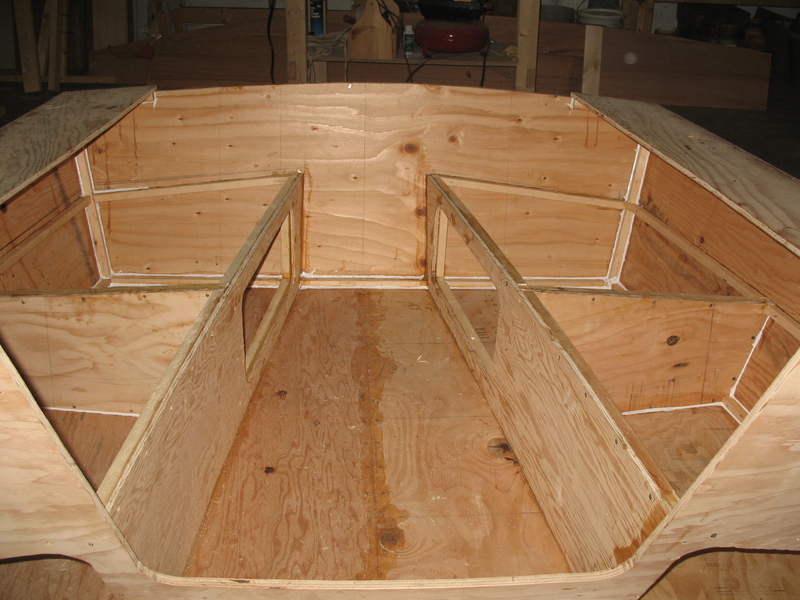 Now that I am nearing that final step, I am already looking to the next task, which is to install the seat backs, which also serve as the boat’s coaming. That should be easy, I say. How hard can that be? I will soon find out. 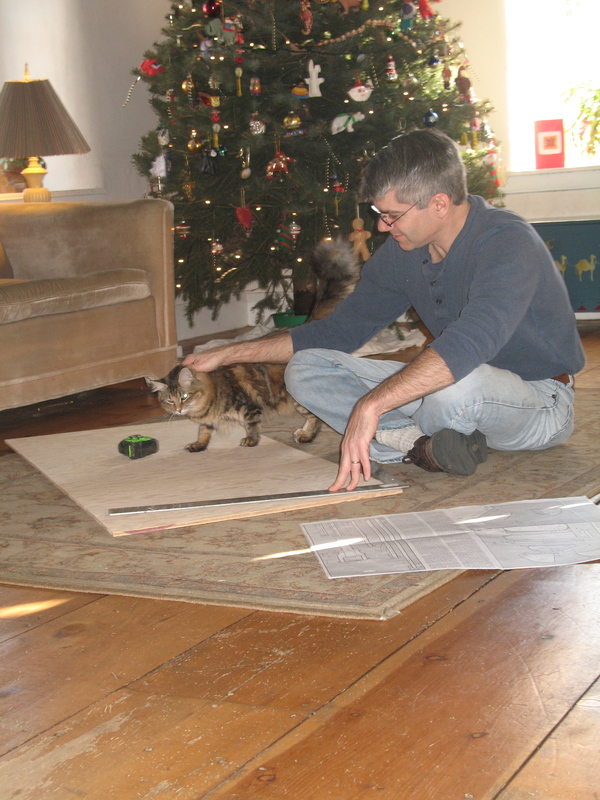 You are currently browsing the Build a Boat, Sail Away blog archives for December, 2009.